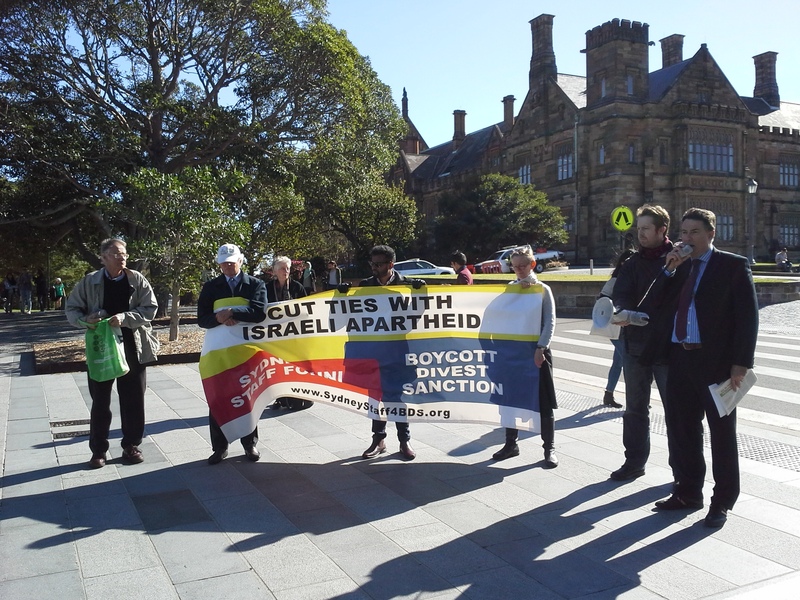 Today’s announcement by Sydney University management that it will not be dismissing Jake Lynch highlights the vexatious and baseless nature of the Israel lobby’s campaign against him, Sydney Staff for BDS (SSBDS) said. SSBDS welcomes management’s decision to end the disciplinary process against Lynch. It brings to an end a politically motivated two-month investigation, initiated in response to pressure on the university from pro-Israel forces. This case must be set in the context of a worldwide upturn in the use of accusations of anti-Semitism to intimidate and silence pro-Palestine voices on campus. In the first four months of 2015, Palestine Solidarity Legal Support recorded 60 instances at US universities where criticism of Israel was met with accusations of anti-Semitism. This unscrupulous tactic of conflating criticism of the Israeli State with anti-Semitism has done great damage to the need to identify and combat genuine racial discrimination, including anti-Semitism, in society. In addition it launched a petition for Lynch’s sacking, arguing that “anti-Semitic behaviour, harassment, and intimidation have no place in Australian society and they certainly have no place at the University of Sydney.” Even after the charge of anti-Semitism was found to be groundless, AUJS’s Julian Kowal maintained that Lynch had compromised the university as a “safe space for Jewish students”, for which he should be dismissed. In this light, Dean Sherr’s recent claim that AUJS’ campaign against Lynch does not rest on a complaint of anti-Semitism stands exposed as a scandalous bid to rewrite the factual record. Peter Wertheim has stated that “the charge of antisemitism is not levelled lightly,” but the barrage of irresponsible op-eds smearing as Lynch as anti-Semitic suggests otherwise. 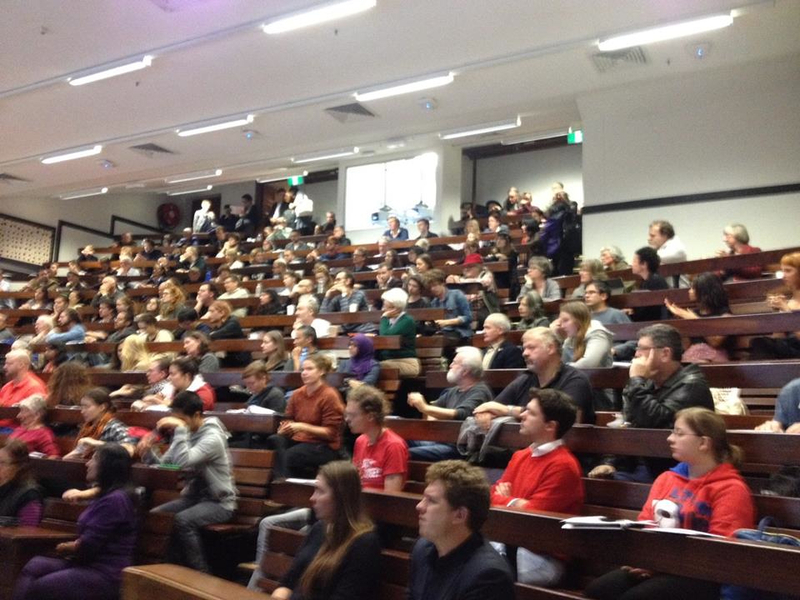 Under the headline “Antisemitism on Campus: Has Sydney University’s Jake Lynch Finally Gone Too Far?”, Glen Falkenstein included Lynch’s actions in a discussion of “anti-Zionism”, “which through its manifestations and rhetoric clearly can serve as a mask for blatant antisemitism.” In The Australian, Peter Baldwin continued along the same lines, saying: “My sense is that increasingly anti-Zionism is a mask for occulted anti-Semitism.” In recent weeks such insinuations have continued to flow freely from the pens of Lynch’s critics. “The Israel lobby’s resort to these plainly baseless accusations highlights their lack of any real arguments against Palestine justice activists,” said David Brophy. This attack is wrong, it is cowardly, it is corrupt. It must not be tolerated. A speech delivered to the April 29 campus meeting opposing the disciplinary action being taken by the University of Sydney against SSBDS member Jake Lynch and five students, all advocates of Palestinian human rights. I acknowledge that we’re meeting on Aboriginal land. I’d like to put our current agonies in context by asking what the value of dissent is in a university. Some people have expressed disbelief that freedom of speech could be invoked to defend the students’ protest against Richard Kemp. They’ve denounced what they call our “perversion” of that concept. Our critics, including the Vice Chancellor, have made it clear what forms of dissent they’re prepared to tolerate. Only speak when it’s your turn; don’t raise your voice; always be tolerant of others – unless, of course, you’re the Vice-Chancellor himself, when you get to threaten people with the sack if you find their views hard to bear. Protest, interruption and dissent are what democracy looks like. That’s not an empty slogan: it’s the fact of the matter. We can’t allow academic decorum to paralyse us so rigidly that we’re prevented from turning our heads to face the lesson of history: it’s the young activist with her megaphone, not the intellectual in their seminar room, who leads the struggle for a better world. Students routinely interrupt speakers on university campuses. In threatening them with disciplinary action, the leaders of this university obediently do their bit to legitimize and reinforce one of the most dangerous features of modern societies – the criminalization of dissent. This is the opposite of the civic purpose a university should fulfil. Today we’re told what an intolerant, disrespectful, uncivil thing it was to interrupt Richard Kemp – Richard Kemp, who brags of the humanity of the army that littered Gaza with over 2000 Palestinian corpses less than a year ago. I wonder what they’ll tell us tomorrow, or the day after. Perhaps that it’s disrespectful to hold a political meeting? They’ve already banned a meeting on Anzac day and militarism. Or perhaps that it disturbs people to hand them a political leaflet on their way into university. Or maybe they’ll tell us that we can’t be too critical of politicians at conferences, or in our tweets. Is this irresponsible hyperbole? It’s a matter of public record that these kinds of censorship are already happening at our university. Our current Chancellor is from QBE Insurance. Who’s to say our next one won’t be from SBS? Yesterday, the Vice-Chancellor posted an article on Yammer by the Human Rights commissioner, Tim Wilson, defending the sacking of Scott McIntyre for expressing his political views. The VC said the article was “interesting”. So, who here is really on the side of free speech? Those of us defending protest and dissent, or those who demand the scalps of staff for their political views and who support dragging them and students through an inquisitorial legal investigation? Free speech can’t be invoked to quarantine power from its critics and to doubly silence the voiceless. Disruption is what protest is for. Another name for it is “speaking truth to power”. Suppressing it in the name of civility is to substitute etiquette for the real battle of ideas. And what about Jake in all this? Education should be directed to the liberation of human capacities. Academics aren’t just obliged to conduct free enquiry and disseminate its results; we also have a duty to maximize the opportunity for others to do the same. In advocating justice for Palestine, Jake’s intention has been to do exactly that. Now, he is facing the sack for his principled expression of a conscientious and nonviolent educational politics. A more serious affront to the university’s purpose couldn’t be envisaged. Teaching and research are already heavily shackled by inequalities of class, gender and race – as Palestinian academics and students know only too well. They must not also be subject to the politically-motivated interference of university administrations. It’s not a coincidence that this attack is being made against a BDS exponent. It’s precisely the controversial views which the principles of intellectual and political freedom are needed to protect. What’s being done to Jake is an attack on every student and academic here, whatever their views on Palestine and BDS. It’s wrong; it’s cowardly; it’s corrupt; it must not be tolerated. Defending Jake and the protesters is incumbent on everyone who thinks dissent matters. Universities should be places where people stand up to power, not where they are docile and compliant before it. Otherwise we’re consenting to the servile debasing of education for political gratification, and professing the creation and reproduction not of knowledge but of propaganda. ‘Civility’, Zionism and the hostile corporate takeover of scholarly communities. Antony Pincombe on This attack is wrong, it is cowardly, it is corrupt. It must not be tolerated. Narendra Mohan on This attack is wrong, it is cowardly, it is corrupt. It must not be tolerated.